SSAT - STERILITY CULTURES FOLLOWING PANCREATECTOMY WITH ISLET AUTOTRANSPLANTATION IN THE PEDIATRIC POPULATION: DO THEY MATTER? Pancreatectomy with islet autotransplantation (IAT) is a treatment for children with chronic pancreatitis refractory to medical and endoscopic management. Sterility cultures from the pancreas and islet cell solutions are often positive, yet the implications of transplanting these contaminated media have not been studied in the pediatric population. A retrospective review of all patients who underwent IAT from 2015-2018 at a single institution was performed. Sterility culture data for each patient were obtained and included results from the transport media (pancreas preservation solution) and transplant media (fluid containing the final islets for transplantation). All patients received prophylactic perioperative meropenem and vancomycin for 72 hours per our protocol. If cultures resulted positive, antibiotics were extended for a total of seven days. Primary outcomes were postoperative fever and 30-day infectious complications. 41 patients underwent IAT during the study period, of whom 39 had total pancreatectomy and 2 had subtotal pancreatectomy. 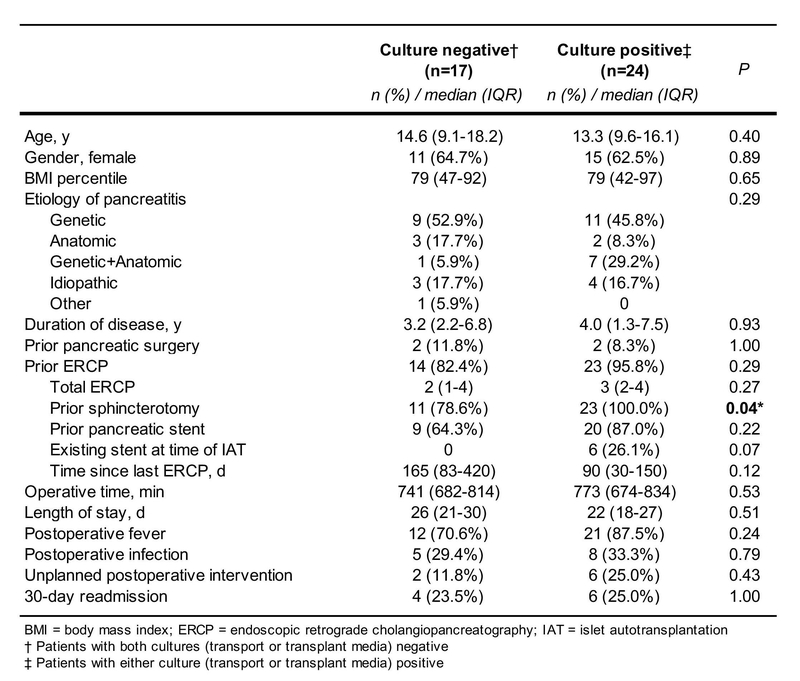 Seventeen (41.5%) patients had negative cultures of both the transport and transplant media, while 24 (58.5%) patients had a positive culture from either sample. Of these patients, 13 (31.7%) were positive in both, 10 (24.4%) had positive transport media only, and 1 (2.4%) had positive transplant media only (FIGURE A). Among these positive cultures, a variety of gram-positive, gram-negative, and fungal organisms were isolated (FIGURE B). Patients with a positive culture were similar with regard to age, gender, etiology, and disease duration (all p > 0.05) compared to patients with negative cultures. A similar number of patients in each cohort underwent ERCP prior to IAT (95.8% vs 82.4%, p=0.29), but the positive group was more likely to have had a sphincterotomy (100.0% vs 78.6%, p=0.04) and trended toward a higher likelihood of having an existing pancreatic stent at the time of surgery (26.1% vs 0%, p=0.07). There were no differences in postoperative fever or 30-day infectious complications (p > 0.05 for each) (TABLE). This is the first study to explore the impact of positive sterility cultures following pancreatectomy with IAT on postoperative infectious outcomes in the pediatric population. Preoperative instrumentation of the pancreatic duct is a risk factor for positive cultures, and while the majority of patients had a positive culture, a positive culture was not associated with post-IAT infection or morbidity. Future work is necessary to study the optimal perioperative antibiotic regimen in these patients. The majority of patients have a positive sterility culture during IAT. (A) Distribution of sterility culture results for transport and transplant media. (B) Microorganisms isolated from IAT sterility cultures.